A little more work done on these guys. I got the trousers and boots done, leaving just the skin and hair to finish them off. I'm approaching the end of this project now and have to say I've thoroughly enjoyed it. It's been a real departure from some of the things I've worked on recently and has given me a very enjoyable break from painting GW Warhammer 40K stuff. So here we go with another splosh or two of paint. I got about 40 mins in this morning and got the tunics done on these guys and all the wooden bits (reverse of shields, spear handles) drybrushed. Trousers and boots next, then on to the skin/hair. I've had a horrible couple of weeks at work and as a result not got much done. There seems to be some light at the end of the tunnel now so hopefully I can start to pick up the pace a bit. 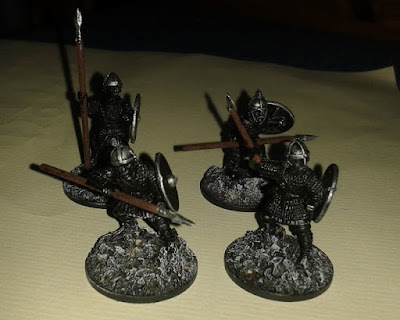 Anyway - I've done a little more work on my Hearthguard unit - they now have some drybrushed armour, some painted leatherwork and the wooden face of the shields are done. Paint: another day, another dollop. 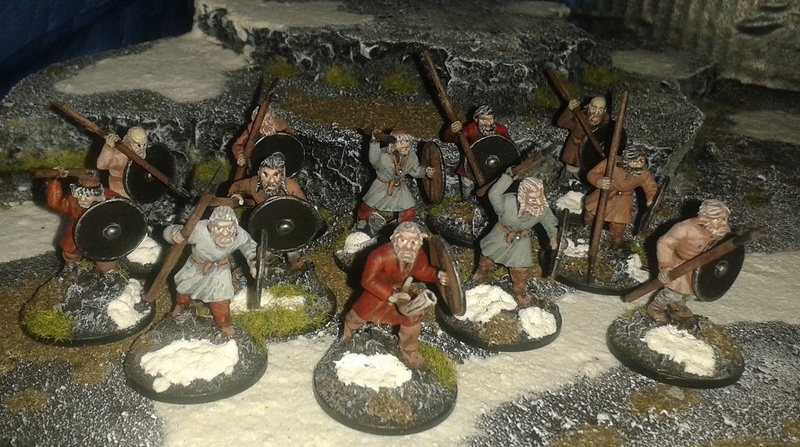 I'm still not really back in to a routine in 2016 yet, but I've finally made a start on another unit for my nearly finished Saga Anglo-Saxons. 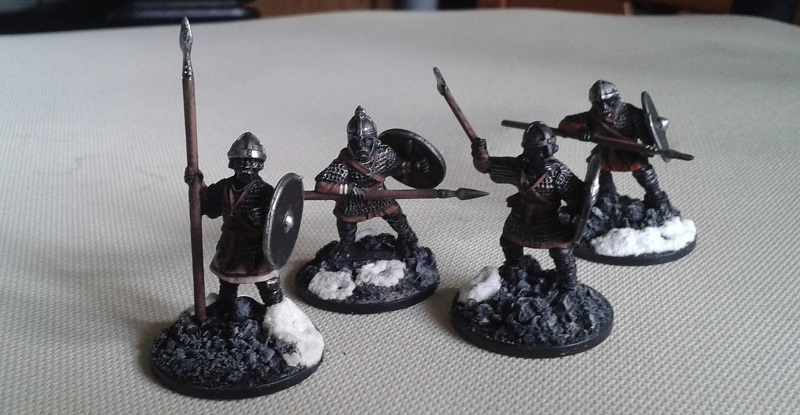 Another four-man Hearthguard unit. 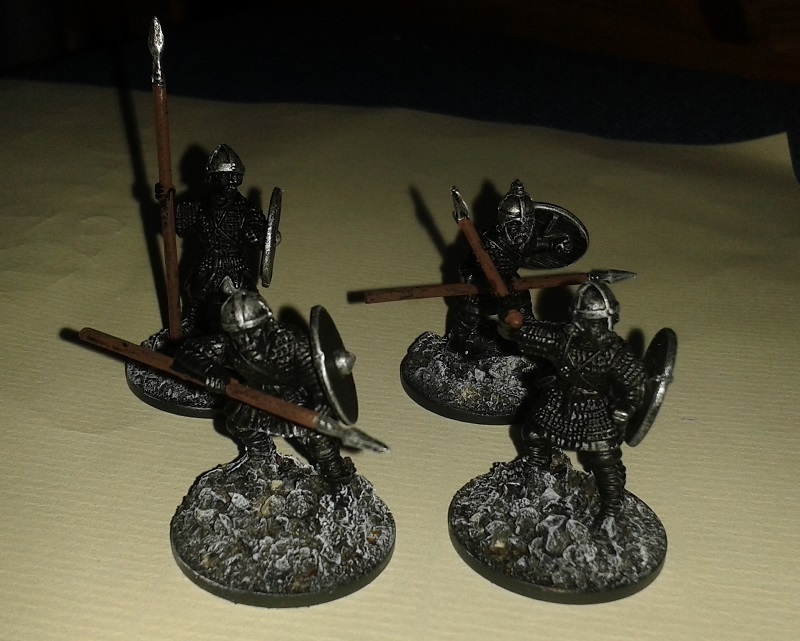 So far all I've done is drybrush the rocky bases, the weapons, helmets and shields and painted a basecoat on the weapon handles. I've been dragging my heels with respect to blogging over the Christmas/New Year period. 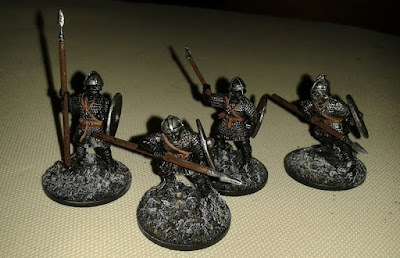 I've been busy (after a fashion) painting but haven't bothered taking any WIP snaps of this unit so I'm just presenting them as a finished unit. So what we have here is a unit of 12 x Gripping Beast "Dark Age Warriors" representing the Levies in my Saga Anglo-Saxon force. That leaves me just 12 models left to finish this army! Woohoo!